This is a sponsored post written by me on behalf of Mission® Foods. All opinions are entirely my own. 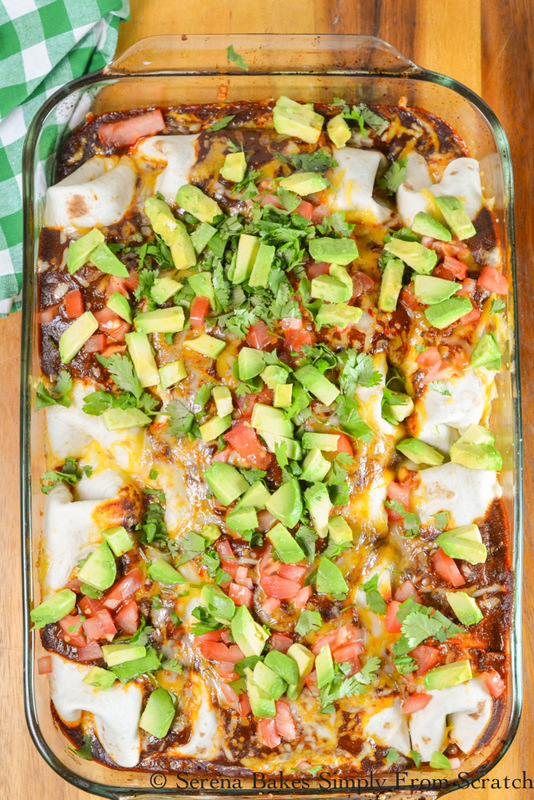 These Oven Baked Steak Burritos smothered in enchilada sauce are everything in our house. We make these quite a bit, sometimes with taco meat instead of steak but either way they are d-e-l-i-c-i-o-u-s! 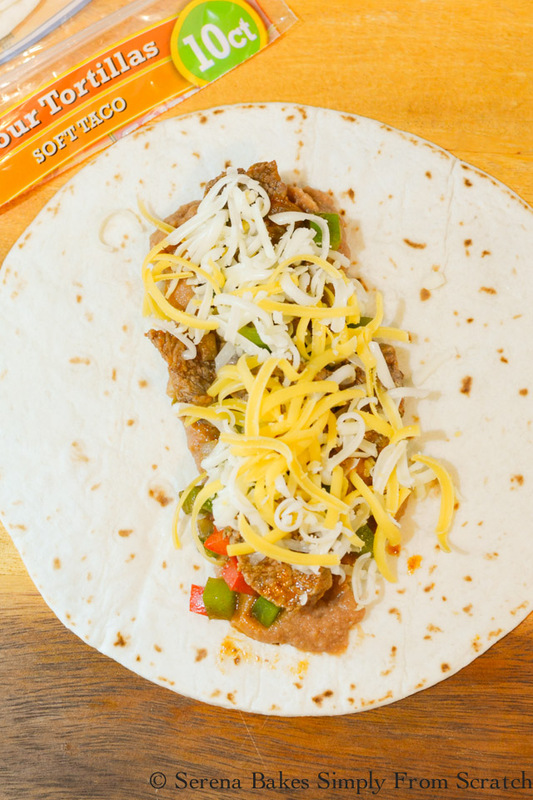 The secret to keeping these quick and easy is using Mission® Super Soft Flour Tortillas. They are so super soft and taste so delicious warmed up. They absolutely make this dish amazing along with the homemade enchilada sauce the burritos are smothered in. The steak filling with refried beans and plenty of melty cheese set these over the top! Who needs to go out for Mexican food when you can make it at home? As if that wasn't enough we served it topped with avocados, tomatoes, and cilantro with Mission® Strips Tortilla Chips to grab all the goodness that fell out of the burritos. These are fo sho what we will be having for Cinco de Mayo and any other chance I get before then. 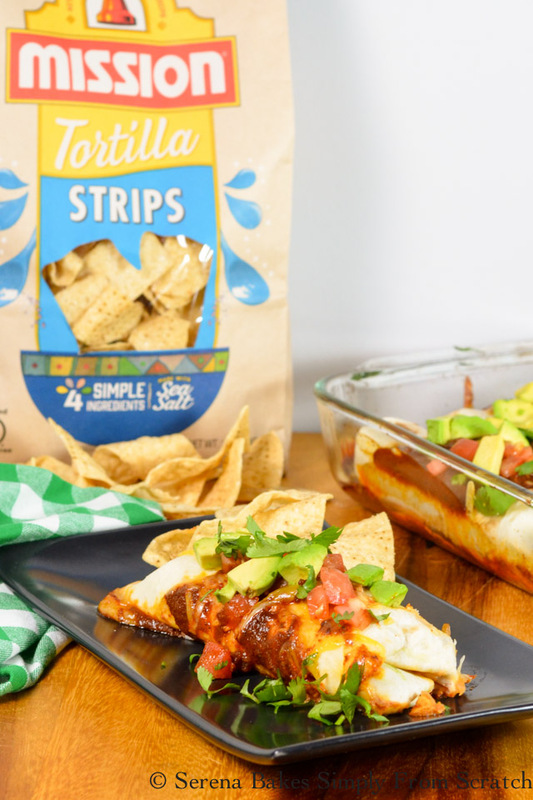 For this recipe you can find Mission Super Soft Flour Tortillas in the tortilla/bread aisle and the Strips Tortilla Chips in the chip aisle. They are available across the nation at your local grocery store. If you're unsure you can check the website here. Right now Mission has an Instant Win Piñata Game. You have the chance to play the Instant Win Piñata Game once every day. Prizes could vary from Mexico cruises to Google Home to Uber gift cards. You can play from now until Cinco de Mayo. How fun is that? To make the Enchilada sauce, in a medium size pan add 3 tablespoons Grape Seed Oil or Olive Oil. Add 1/2 a whole Diced Onion and cook over medium-high heat until starting to caramelize. 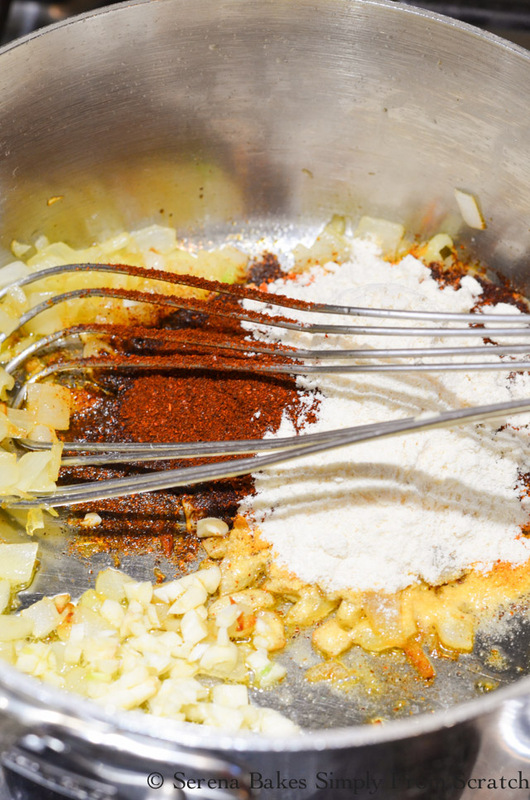 Stir in 3 cloves Minced Garlic, 1/3 cup Chili Powder, and 2 1/2 tablespoons Corn Flour. Cook for about 45 seconds, until fragrant. Slow stir in 3 cups Water, 6 ounces Tomato Paste, 2 teaspoons Cumin, 1 teaspoon Oregano, and 1 teaspoon Salt. 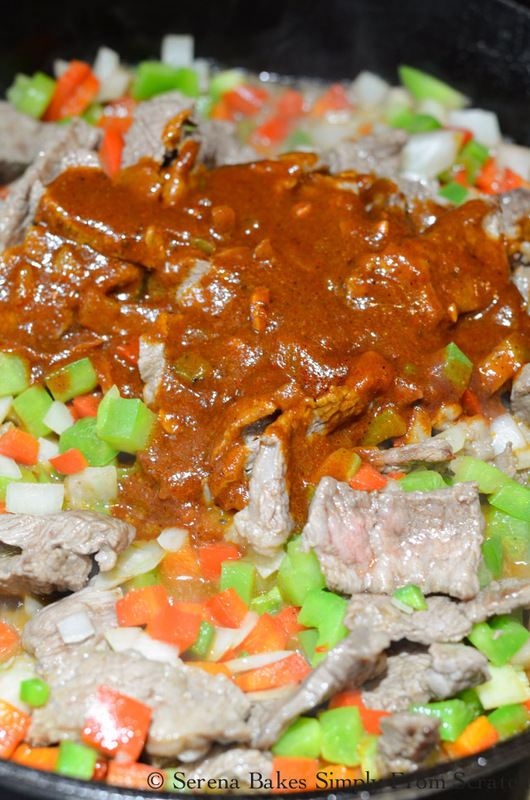 Stir until smooth and simmer over low heat while making steak filling. In a large skillet heat over high heat 2 tablespoons Butter, and 1 tablespoon Grape Seed Oil or olive oil. Once hot add 1 pound Thinly Sliced Sirloin Steak. Cook until steak just starts to brown, and flip over. Add the other 1/2 whole Onion Diced, 1 whole Diced Red Bell Pepper, and 1 whole Diced Green Bell Pepper. If you like it spicy you can add 1 whole Diced Jalapeño with the seeds removed. Cook until onion is softened and stir in 3/4 cup of the Enchilada Sauce. Remove from heat to prevent over-cooking the steak. Grab your 10ct. 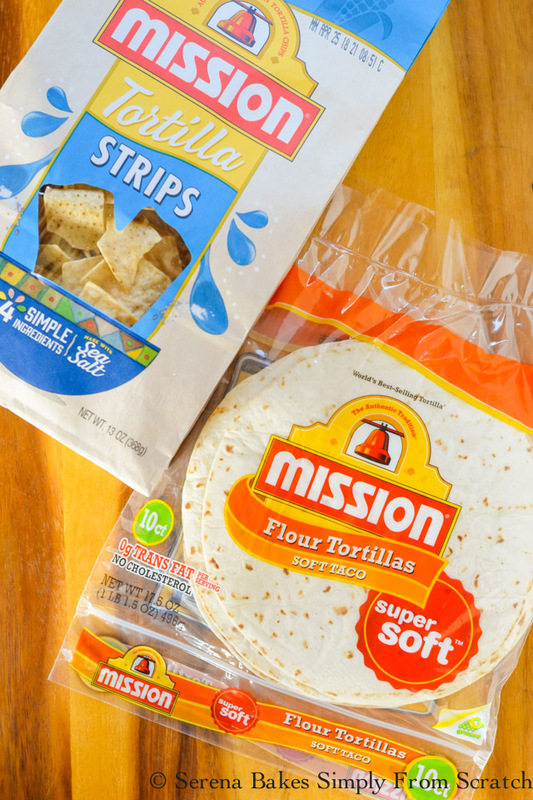 Mission Super Soft Flour Tortillas. If you have a large work area I find it easiest to lay all the tortillas out to be filled. Spread a heaping spoonful of heated refried beans down the center of tortilla. Top with steak filling. Cover with 2 tablespoons of Jack and Cheddar Cheese mix. Tuck sides in and roll into a burrito. 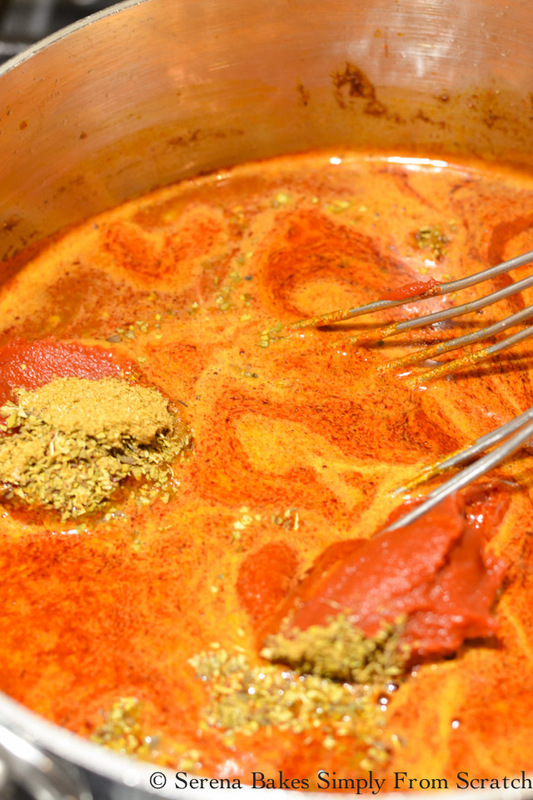 Cover the bottom of a large baking dish with a thin layer of enchilada sauce. Place burritos seam side down. Cover the center of each burrito with enchilada sauce and cover with 1 1/2 cups Jack and Cheddar Cheese mix. Bake in a 400° oven for 15-20 minutes until cheese is melted and burritos are hot. We like to add fresh Chopped Cilantro, Diced Tomatoes, and Diced Avocado for serving. It can always be served on the side along with Sour Cream. Whatever you do don't forget the Mission Strips Tortilla Chips for scooping up all the filling that falls out. 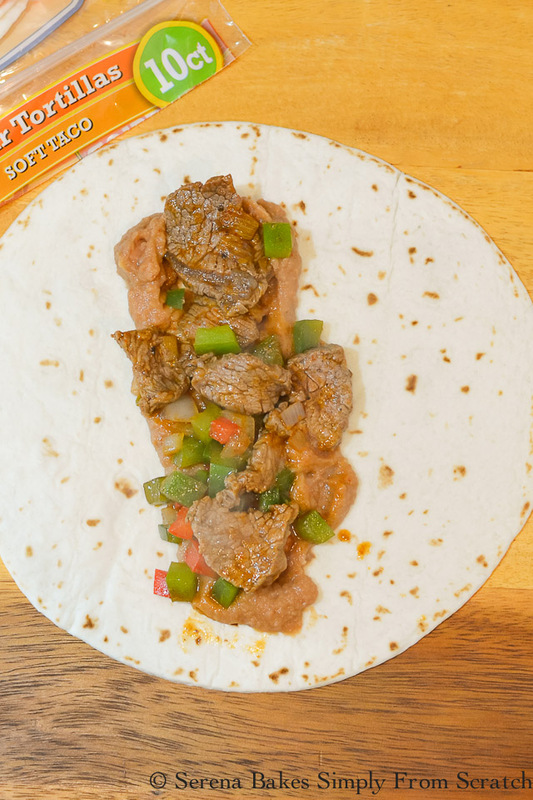 Oven Baked Steak Burritos using Mission Super Soft Flour Tortillas are a guaranteed hit for your Cinco de Mayo celebration, or just because! They are our go to even when we make a fajitas or quesadillas recipe. Plus, they are delicious when used to make pinwheels filled with meat and cheese instead of a sandwich. 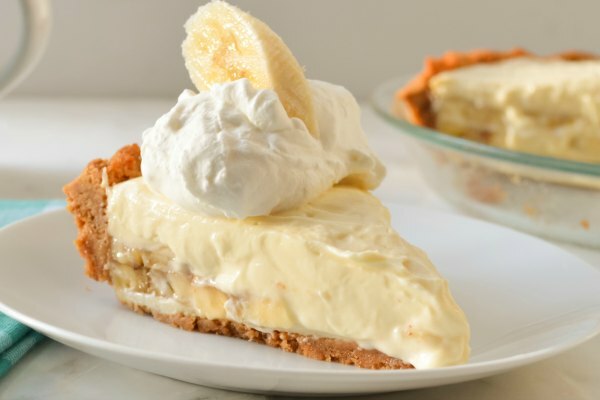 You can find more great recipe ideas and inspiration at Mission Recipes! 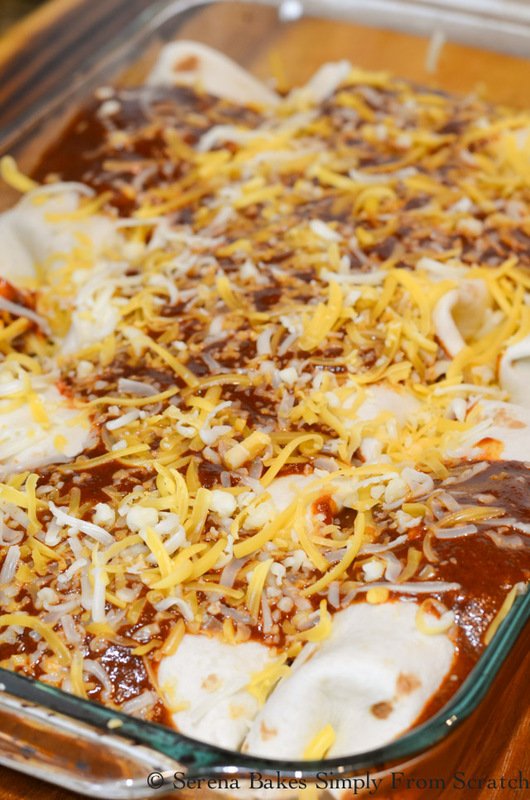 Oven Baked Steak Burritos smothered in homemade enchilada sauce are perfect for Cinco de Mayo. The flavor’s amazing and they are easy to make. Add oil, and onion to a medium sized saucepan. Cook over medium-high heat until onion starts to caramelize. Stir in garlic, chili powder, and corn flour. Stir for about 45 seconds until fragrant. Slowly stir in water to prevent lumps. Add remaining ingredients and stir until well combined. 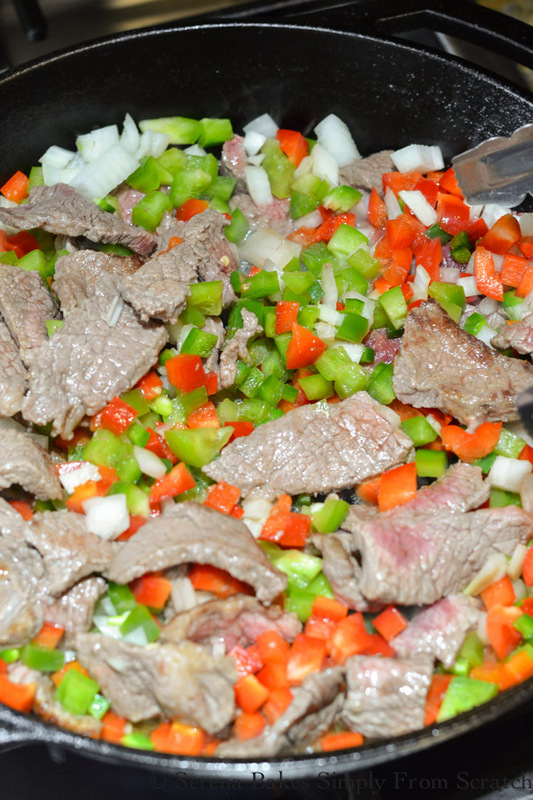 Simmer over low heat while making steak filling. In a large skillet heat butter and oil over high heat until hot. Add steak in a single layer and cook until steak starts to brown. Flip steak over and add onions, bell peppers, and jalapeño if using. Cook until onion is softened. Stir in 3/4 cup enchilada sauce. Remove from heat to prevent over cooking the steak. In a large oven safe baking dish place a thin layer of enchilada sauce, and set aside. 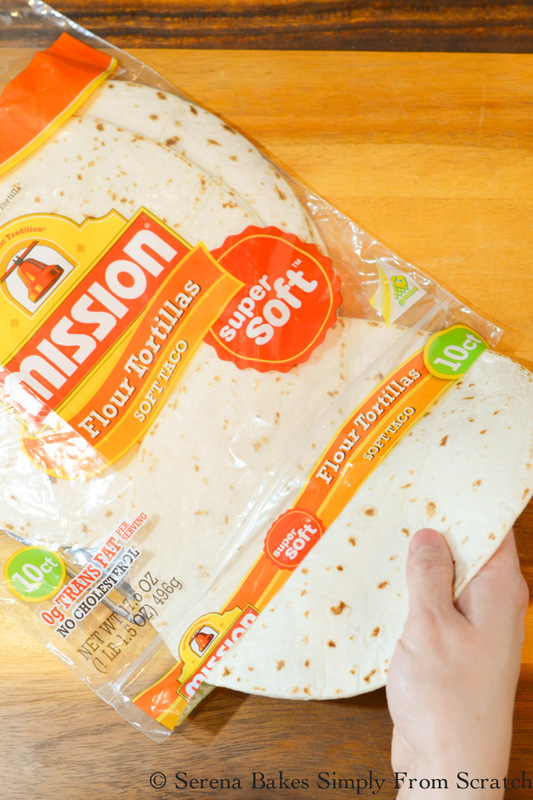 Lay Mission® Super Soft Flour Tortillas on a work surface. Spread with a heaping spoonful of refried beans. Top with 2 spoonful of steak filling. Cover with 2 tablespoons cheese mix. Tuck sides in and roll like a burrito. Place burritos seam side down in enchilada sauce. 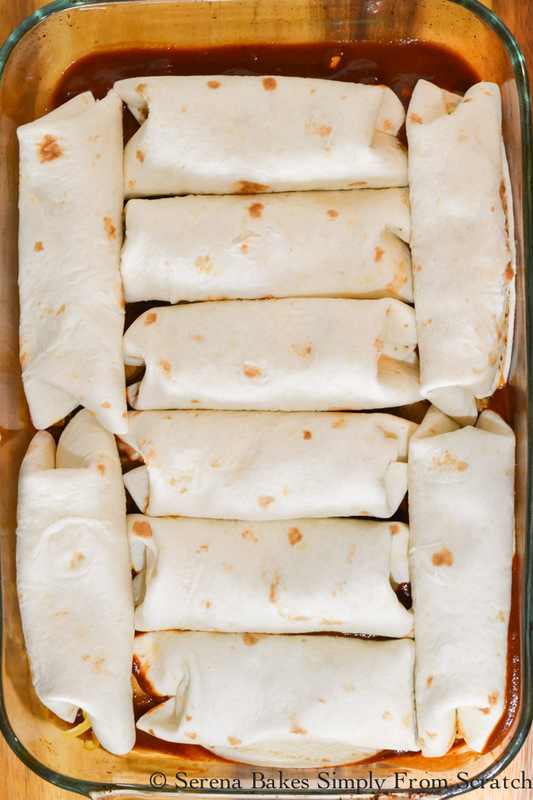 Cover the center of each rolled burrito with a strip of enchilada sauce, and cover with remaining cheese. Bake uncovered for 15-20 minutes until cheese is melted and burritos are hot. Garnish burritos with desired condiments or serve on the side. 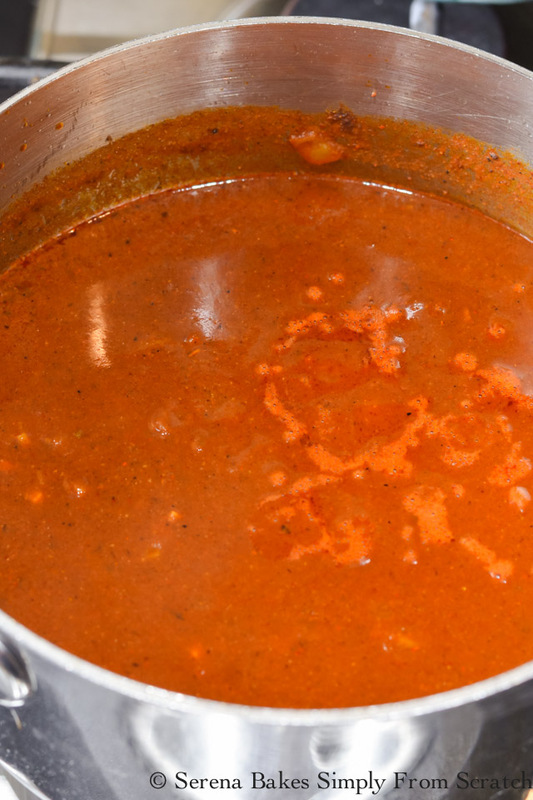 Enchilada sauce can be made ahead of time and stored in the fridge and reheated before using. 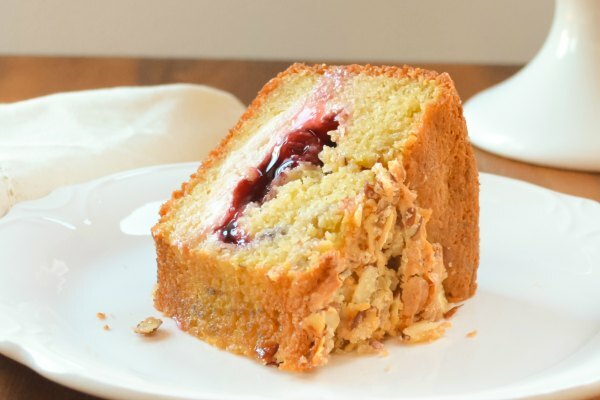 Calories don't include additional ingredients for serving. 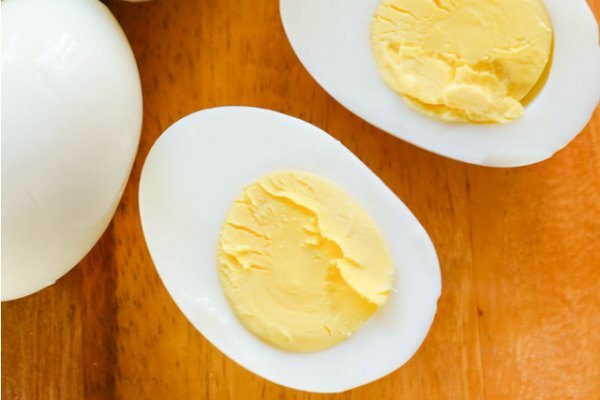 So easy to make and soo yummy! !